A cultured extract of hybridized medicinal mushroom Mycelia (roots). 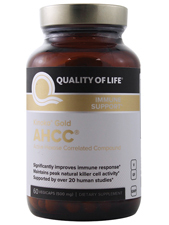 AHCC is one of the world's most researched specialty immune supplements, supported by over 20 human clinical studies. Studies on AHCC have been conducted at some of the finest research institutions worldwide, including highly regarded Ivy League universities. * Increase the activity & number of Dendritic Cells. Unlike most other medicinal mushroom extracts, AHCC has a very low molecular weight of just 5,000 Daltons and is rich in Alpha-Glucans - increasing absorption and efficacy. Because of it's superior supporting research, AHCC is used by an estimated 1,000 clinics worldwide. Warnings: Keep out of reach of children. Consult your healthcare professional before use if you are pregnant or lactating, have or had a medical condition or are taking prescription drugs. Additional Info: Do not use if seal is broken or missing. Store at room temperature. Suggested Use: 2 Vegicaps (up to 3 times) daily before meals.